Speaking of migration, did you know that until the late 1700s, it was commonly thought that birds hibernated in the mud in rivers and lakes during the winter? The British doctor Edward Jenner, who is best known for discovering the smallpox vaccine, was also interested in hibernation, and conducted extensive studies on hedgehogs and other hibernating mammals. He was among the first to remark that birds were not dirty or muddy when they reappeared in the spring. Nor were they thin and hungry like other hibernating animals when they emerge in spring. So where did the birds go? Jenner dissected spring-returning birds and examined the contents of their stomachs, to see what, if anything they had been eating. He found seeds of plants not native to Britain. He also noted that these species of birds had been seen flying far out across the oceans. So he hypothesized that the birds were leaving Britain to go someplace else in winter. Unfortunately, Jenner died before he was able to write up his studies on bird migration, but his family published them after his death. Modern research has confirmed his theory: birds do not hibernate in mud, they migrate. That such a basic scientific fact was not discovered until the late 18th century raises the question of various "scientific" statements made by the early Jewish sages. When I was growing up in the 1950s and 60s, it was taken for granted among Jews that when it came to science and medicine, the modern discoveries take precedence over any folklore that might be in the Talmud or other earlier writings. We went by the opinion of Maimonides, one of the greatest Jewish philosophers and a medical doctor, wrote in the 12th century: "Do not ask of me to reconcile everything that they (the Sages of old) stated from science with the actual reality, for the science of those days was deficient, and they did not speak out of traditions from the prophets regarding these matters... " (Guide for the Perplexed, 3:14) In other words, when it comes to science, the Sages were not divinely-inspired prophets nor were they infallible. That was the attitude I grew up with: science was science, no matter who discovered it. But more recently, with the rise of the Haredi (post-WWII fundamentalist Orthodox Jewish) movement, there are those among my Jewish brethren who expect us to take absolutely everything the Talmudic rabbis said as literal scientific fact, trumping anything the secular scientists might since have discovered. I find this impossible to do without having to turn my brain off -- an option I doubt God would want. After all, God gave us brains to learn with. The rabbis of the Talmudic era were very wise, but when it came to science, they were limited to what was commonly known around them. Thus, you find things like the curious statement that "lice come from sweat" and it is therefore permissible to kill them on the Sabbath (Shabbat 107b) when we normally do not kill living things. At the time of this ruling, "spontaneous generation" of insects and other creatures was taken for granted by the whole known world, not just the rabbis. Aristotle wrote that certain lower animals “are not produced from animals at all, but arise spontaneously: some are produced out of the dew which falls on foliage... others are produced in putrefying mud and dung, others in wood, green or dry, others in residues, whether voided residues or residues still within the living animal.” Eels and fishes were commonly believed to come from the foam of the sea and flies from rotten meat. But today we know that lice come from the eggs of other lice, and are indeed living things. The same goes for the Talmudic mice that are "half dirt and half flesh" (Chullin 9:10, Sanhedrin 91a), another biological impossibility. For that matter, DNA wasn't even discovered until 1962 -- when I was still in high school. Yet look how much -- in my own lifetime! -- that discovery has fundamentally changed our entire perspective on the natural world! All the "ancient wisdom" about passing down characteristics through "blood" is now rendered obsolete. These may seem like trivial issues to some people, but for many Orthodox Jews, they are serious challenges to our faith. If the Sages were wrong about lice and mice, are they also wrong about other things, too? Can we trust anything the Talmud says in the face of these absurdities? If you see Judaism (or any other religion) as a house of cards that will tumble with even the slightest question or error, then science can seem very threatening. But if you can make a distinction between science studying the "how" of the natural world and theology dealing with the "why" of human existence, there is no conflict between science and religion. Science tells us how things work, but it is neutral on questions about God, the soul, and religious laws. Scientifically, there is no reason I should not eat pork or mix meat with milk, because these laws are not about science per se. I don 't keep kosher because is is more healthy or more natural, but because it is the will of God for me as a Jew. And if I had lice (which I thankfully do not!) it would still be permissible to kill them on the Sabbath, even though we now know they do not spontaneously generate from sweat. This is also why, when I see birds migrating, it is no challenge to my faith. March storm is roaring like a lion! 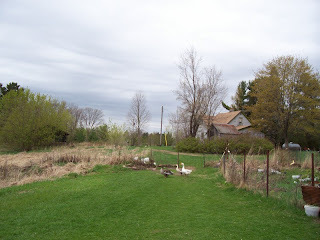 A few days ago, it was in the mid-50s with my chickens out foraging in patches of bare ground. There were even bits of green grass poking up, I heard robins calling and saw my first pair of Canada geese returning for the season. Today, I slogged through knee-deep snow drifts in howling 50 mph winds to get to the coop. As the saying goes, "If you don't like the weather in Minnesota, just wait 10 minutes." All the poultry are shut inside -- literally "cooped up" -- happily dry and safe. I even got 8 eggs. My two ganders were fighting -- not too seriously, but another sign that spring is coming. And here is essentially the same view in early spring that same year -- a sight I'm definitely looking forward to SOON! 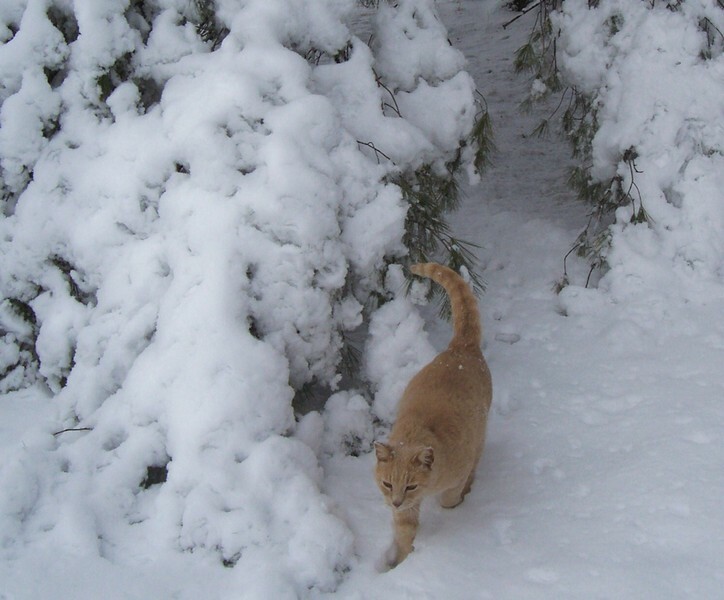 As for why we are getting so much snow lately, see my previous blog post, "If the earth is warming up, why are we getting so much snow?" 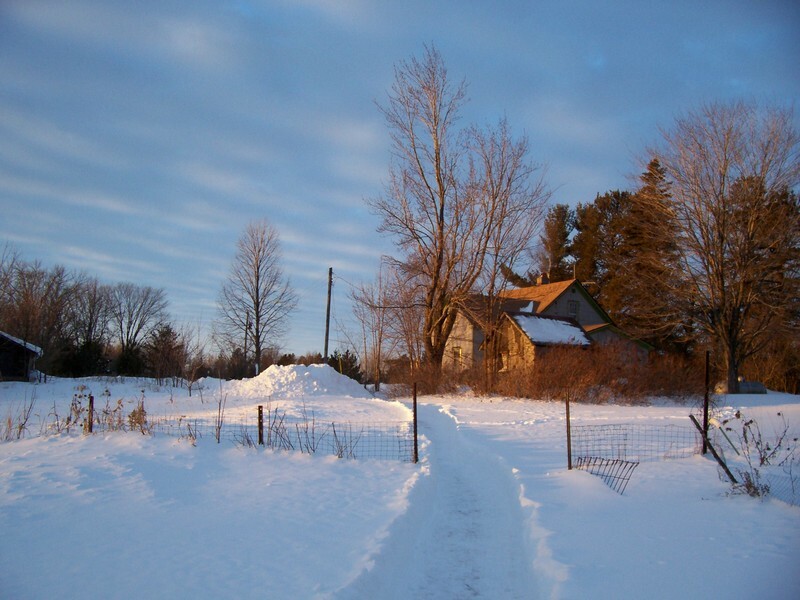 Warm days, cold nights -- maple syrup time! 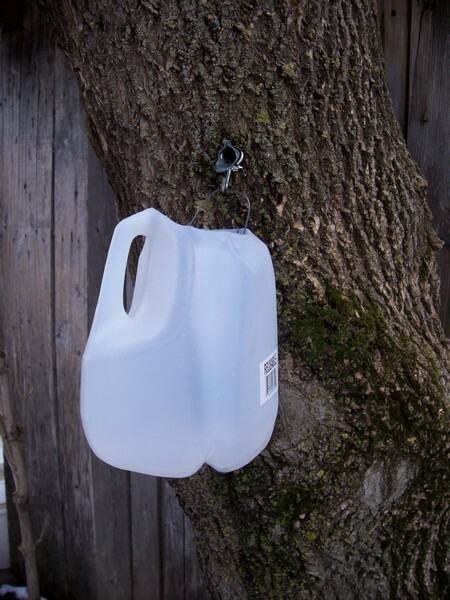 It has been two years since I've been able to make maple syrup -- 2009 we were in a drought and I did not want to stress my trees. Spring 2010 there was no snow left (believe it or not) and a burning ban was in effect. But this year should be perfect! We had a wet summer in 2010, plenty of snow cover, and now the sap is running! This is always one of the most pleasant times for me to be outside. 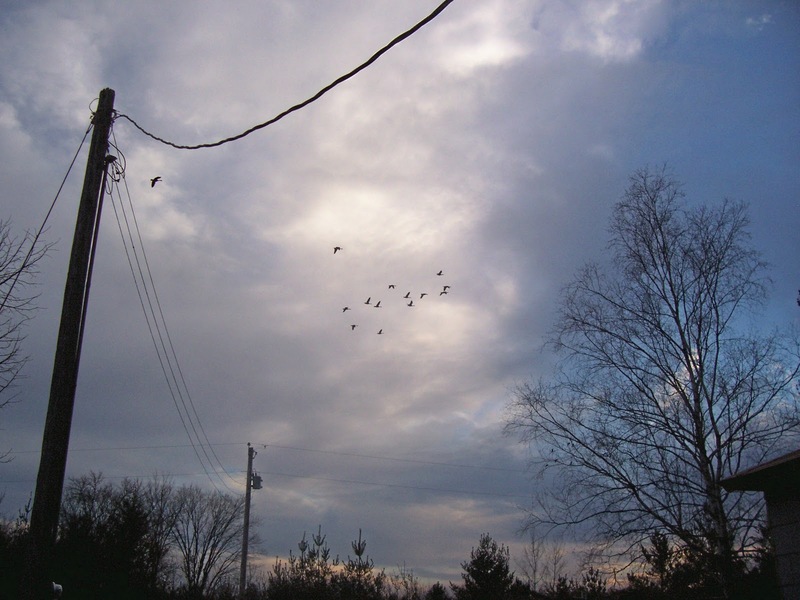 The weather is mild, and the birds are starting to claim their territories. On Monday, when I was putting the spiles (taps) in my trees, I heard chickadees and blue jays calling, woodpeckers drumming, and a flock of crows having an argument out in the woods. No grouse drumming or turkeys gobbling yet, but it won't be long. Commercial syrup producers would probably die laughing at my primitive backyard setup. But it gives us enough syrup for our own use, and saves a lot of money. When I checked in the grocery store recently, pure maple syrup was $7.99 for an 8-ounce bottle -- and that was for a local product. (The Audubon Center of the North Woods, only a couple miles from my home, makes it every year as a fundraiser.) I imagine if commercial shipping were also involved, the price would be even higher. We usually get a gallon or more of syrup a year, which I can in pint Mason jars. Add that up, and it's a pretty valuable crop! These are some pictures I took in 2008, which show the process. For "buckets" I use gallon milk jugs, which are free. For spiles I have the old-fashioned metal kind I got years ago. I cut the top off the jug to make it more like a bucket, then add a wire loop for a handle. 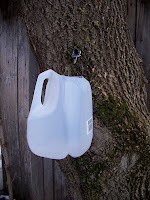 This works well, and at the end of the season I just remove the wire, wash the jug and recycle it. The spiles I save for next year. By the way, you don 't have to use sugar maple trees. ALL maples have sugary sap, and many make great syrup. Mine are boxelders (also known as "split-leaf maple"), which many people consider "trash trees" but I see as a valuable resource. The syrup I get from these trees is excellent. Plus, the leaves are the food plant for Cecropia moth caterpillars. 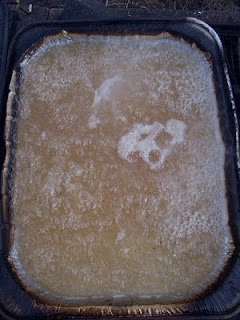 ﻿﻿ As you can see, syrup in the early boiling stages doesn't look very golden. There is a sort of whitish stuff that precipitates out -- this has to be filtered out later or the syrup will be bitter. I use a piece of ordinary felt inside a kitchen strainer. Timing is very important: If you strain too soon, the white stuff slips though, but if you wait too long, the syrup is too thick to go through the felt. Some people use a hygrometer and measure the specific gravity, or a candy thermometer to measure the temperature. I just go "seat of the pants," having learned from years of doing this. If it's still too thin after straining, I just boil some more. 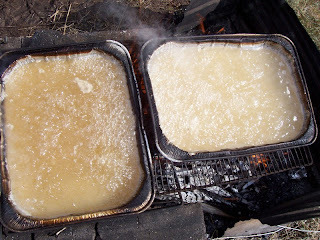 It takes a lot of sap to make syrup -- about 30 gallons for one gallon of product, so you have to keep adding sap all day. During this time, I do a lot of yard cleanup. The firewood comes from stuff I saved up last year, plus any dead wood that the wind might have brought down, etc. You need a continuous hot fire for this, so smaller stuff such as lower dead branches work great. In this next pic, you can see that the pan on the left (pan A) has a higher sugar content than the one on the right (pan B). That's because as the sap boils down, I ladle it from B to A, then fill pan B with more sap. I also pre-heat the cold sap in big tomato juice cans before adding it to pan A. This keeps thing boiling constantly. To keep the syrup from boiling over as the sugar content rises, you need to add some sort of oil to break the tension on the surface. Native peoples used various animal fats, and the pioneers used to hang a strip of bacon over the pan and let is slowly drip in. Nowadays a lot of people use butter or margarine (which is why Mrs. Butterworth's syrup advertised itself as being made with real butter - an innovation in its day.) This is why, if you keep kosher, maple syrup is off-limits unless it has kosher certification. I use 100% vegetable oil so I can gift the syrup to both my kosher and vegan friends. So, if you buy syrup and are concerned about animal products in your food, then it is a good idea to ask what kind of oil or grease they are using. Especially at flea markets and roadside stands! This pan is just about ready to take inside for finishing. At this point, I ladle it through a tea strainer to get as much ash out as possible (with a wood fire, that's inevitable) into a stainless steel deep kitchen pot (one with a heavy copper bottom, less likely to scorch). 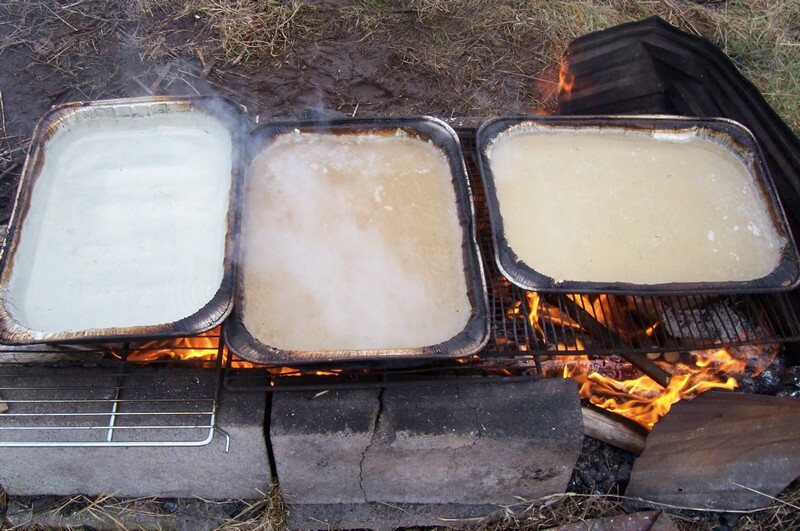 I then douse the fire and carry the syrup into the kitchen, where I finish boiling and straining it. I let it sit overnight so any leftover impurities settle to the bottom. In the morning it's easy to pour off the clear syrup, leaving any sludge behind. 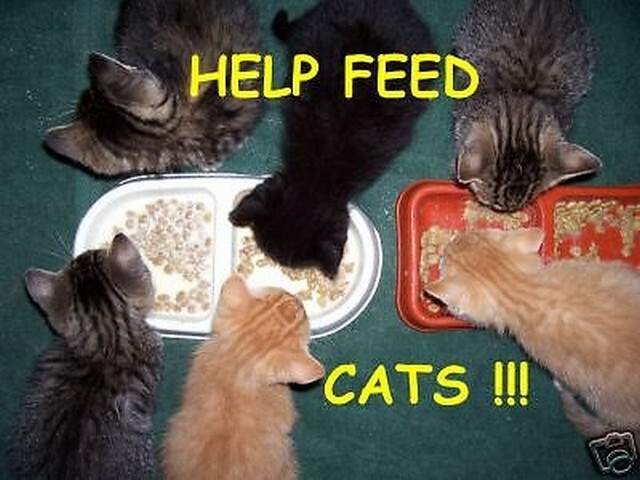 (I add the sludge to the chicken mash -- they like a sweet treat, too!) I then sterilize my canning jars and can it the same as for jelly. Done right, it keeps for years -- but once you open a jar, refrigerate it or it will get moldy. So there you have it -- the first crop of the year on my land. But enough blather -- time to go out and collect that sap! 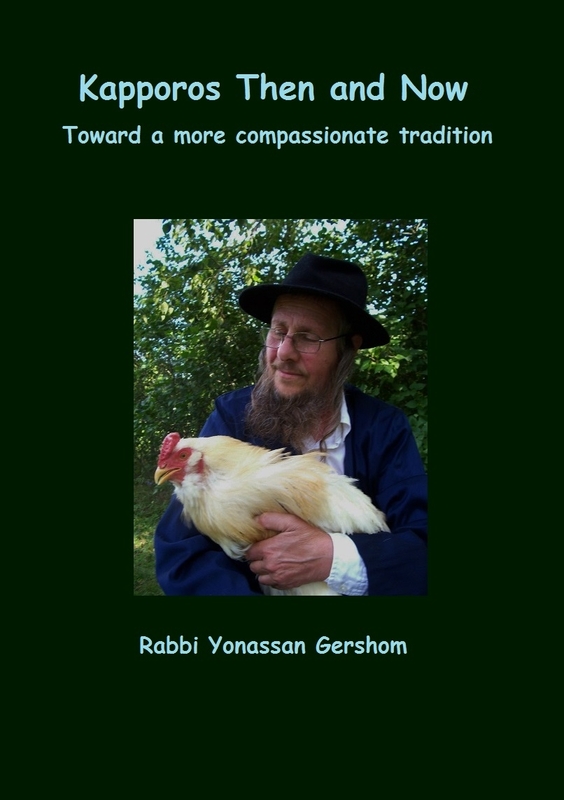 Maimonides also argues that the commandment to send away a mother bird before you take eggs or young from a nest (Deuteronomy 22:6-7) is meant to teach us compassion for the feelings of the mother bird. I have chickens and believe me, they do indeed get upset if they see you taking their eggs. So clearly, from a Jewish perspective, birds and mammals have ruach. Whether or not insects, fish, reptiles, etc. have this level is up for debate. Certainly they experience fear; otherwise, they would not run or swim away. But does a snake feel love? 3. Neshamah (neh-SHAH-mah) is the word most commonly used in colloquial speech for "soul" in the usual sense, that is, an immortal soul that survives death. But it is also the word used in Psalm 150 for "let everything that has a soul praise God." Some translations render this as "everything that has breath," because neshamah is etymologically related to the word neshimah, meaning "breath." Now, if everything that has breath is to praise God, wouldn't that suggest that animals, too, have a neshamah? In Psalm 148, everything in the universe is praising God, even inanimate objects such as the sun, moon and stars. So "praising God" can't really be used as a criteria for whether or not something has an immortal soul. However, we should note that there are many anecdotal stories of people encountering "ghosts" or spirits of animals. So it does appear quite possible that something in an animal survives death. In kabbalah, neshamah is associated with the higher levels of the mind and, interestingly, some Jewish philosophers felt that we are not automatically born with a neshamah, that we must develop it. This is supported by modern brain research. The more we use our brains, the more synapses we develop among the neurons, and the more intelligent we can become. Conversely, a brain that is not stimulated will lose synapses and, in some cases, fail to learn even basic language and reasoning skills. "Use it or lose it" apparently applies in both biology and theology. Jewish philosophy has long regarded knowledge as the only thing we take with us to the Next World, which may be why developing the intellectual neshamah is associated with immortality. But does this mean we are developing a "soul," or simply improving the physical brain? Hard to say. 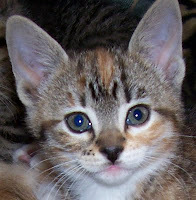 The fact is, we can't really prove there is an immortal human soul, anymore than we can prove -- or disprove -- the existence of an immortal soul in animals. What we can say is that humans do possess a level of intelligence that is greater than even the higher primates, and that we humans can develop a conscious sense of right and wrong that animals lack. (A lion may kill prey, but he does not murder.) Most Jewish thinkers also maintain that humans are the only beings with free will, who can consciously choose to know their Creator. 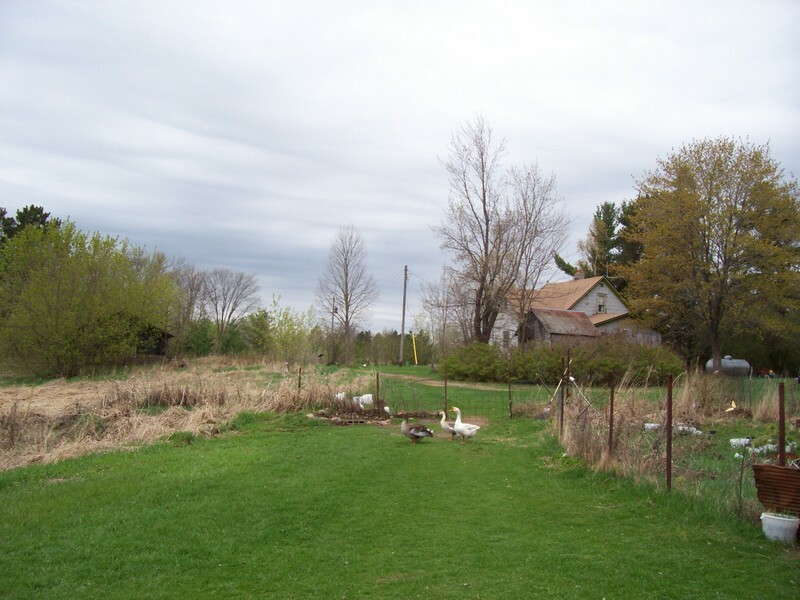 Neshamah is generally connected not only with intellectual pursuits, but also with moral responsibility. In Yiddish, to have a "Jewish soul" (yiddische neshamah) means to have a sense of proper humanity and compassion. In other words, to be a mensch -- an upright person of true integrity and honor -- the highest compliment one can give in the Yiddish language. 4. Chayah (KHAI-yah) literally means "living." It is used in the Torah in Genesis 2:7 , where God breathed the breath of life into Adam and then Adam "became a living soul (nefesh chayah)." Note that this term combines nefesh, the life force of the body, with chayah, "living." But isn't a body with nefesh already living? In the biological sense, yes. So chayah must add another dimension to human existence. (This section was updated on 12/31/15, incorporating some feedback from readers.) 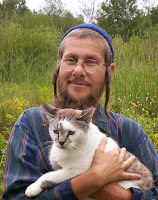 Do other species also have a chayah level? Not in the human sense. But if we regard chayah as the species archetype, then each pair of animals in Eden would be the species' chayah. Nefesh chayah is used in one other place, namely Genesis 1:20, which seems to support this. The full phrase is is "yishr'tzu hamayim sheretz nefesh chayah" which is translated variously as "let the waters swarm (teem) with swarms of living creatures," or with "moving creatures that have life," etc. So the focus is on them being alive, which is what I said the nefesh level was, i.e., the life force of the body. They are all created by direct command, not by having the "breath of life" breathed in separately. Thjis is a main difference between animals and humans. Everything else in the Eden story is created by God simply speaking it into existence: "Let there be light -- and there was light." Only in the case of humans does God "breath the breath of life" into them directly. Again I stress: This does not mean that other creatures don't have life. And we have already demonstrated that many creatures have feelings. But Judaism does take the direct "breathing in" of Adam's nefesh chayah to mean that there is something different about humans as compared to the rest of creation. Rabbi Natan Slifkin, known as the "zoo rabbi" and author of Man and Beast, clearly states that humans are the only beings that have a "divine soul" in this sense. 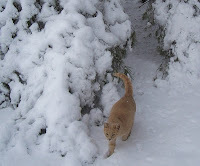 But on the other hand, he also devotes many pages to our responsibility toward animals as stewards of the earth. So do numerous other Jewish commentators. 4. Yechidah (yeh-KHEE-dah) means "unity" and comes from the same Hebrew root as echad, "one" as in "God is One." Yechidah does not appear in the Bible as such, but is a kabbalistic term developed in later Jewish mysticism. Yechidah is the level of the soul where we can "touch God." Judaism does not teach that we can become God or merge entirely with God as some mystical systems do (although some Hasidic thinkers came pretty close to that.) We Jews are not pantheists. But there is a level where we can experience oneness with God's Creation and, through this experience, get a "taste" of the oneness of God. Humans all over the world have reported this type of experience. Do animals also experience oneness with God? It is impossible to say, because they cannot tell us. Some Jewish thinkers (as well as others) maintain that animals -- and, in fact, all created beings except humans -- automatically do the will of God because they were created that way, with no free will to do otherwise. In that sense, they may be more in tune with God than we are. At the same time, they do not seem to have the same level of creativity that comes with our free will. This being the case, why is it that Western civilization -- much of which is based on the Bible -- has become so callous toward animals and the environment? The fault lies not with Judaism, but with a non-Jewish philosopher named Rene Descartes -- "the father of modern philosophy" -- who lived in the 1600s and believed that animals are nothing but automatons, unfeeling machines that cannot feel pain. This is not in accord with Jewish thought but, unfortunately, a lot of Jews, as well as many Christians and others, have adopted Cartesian attitudes over the centuries -- a topic we explore in Part 2 of this series.